Tue., 11 Feb. - Wed., 19 Feb. Thu., 12 Dec. - Thu., 19 Dec. Tue., 28 May - Thu., 6 Jun. Wed., 6 Nov. - Sat., 16 Nov. Mon., 9 Sep. - Mon., 7 Oct. Sat., 12 Oct. - Sat., 19 Oct. Thu., 30 Jan. - Fri., 7 Feb. Sun., 2 Feb. - Sat., 8 Feb. Thu., 30 Jan. - Sat., 8 Feb.
Wed., 22 May - Thu., 6 Jun. Fri., 31 May - Sat., 8 Jun. Fri., 15 Nov. - Fri., 29 Nov. Sat., 1 Feb. - Sun., 9 Feb. Sat., 15 Feb. - Sun., 23 Feb. 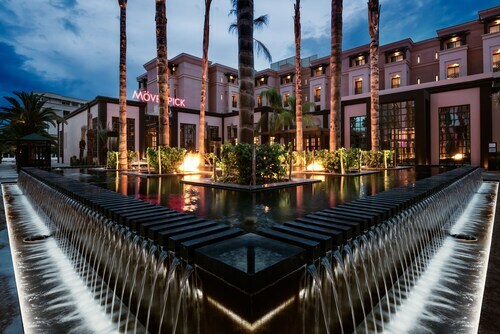 This family-friendly Marrakech hotel is located near the airport, within a 15-minute walk of Menara Mall, Palais des Congres, and Menara Gardens. Jemaa el-Fnaa and Oasiria Water Park are also within 3 mi (5 km). Marrakech Central Station is 23 minutes by foot. 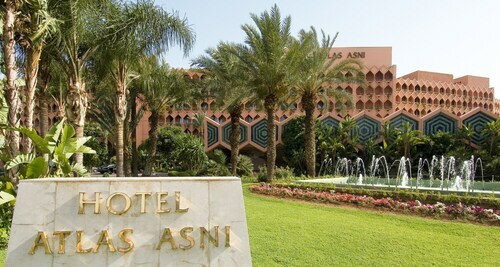 Located in Hivernage, this spa hotel is within a 10-minute walk of Theatre Royal, Harti Garden, and Palais des Congres. Place du 16 November and Menara Gardens are also within 2 mi (3 km). Marrakech Central Station is only a 4-minute walk. This family-friendly Marrakech hotel is located in Agdal, within 2 mi (3 km) of Cinema Megarama, Agdal Gardens, and Place of Youth. Jemaa el-Fnaa and Oasiria Water Park are also within 3 mi (5 km). This family-friendly Marrakech hotel is located near the airport, within a 15-minute walk of Cinema Megarama and Agdal Gardens. Jemaa el-Fnaa and Oasiria Water Park are also within 3 mi (5 km). 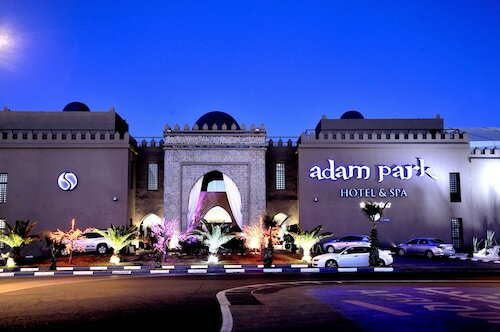 Located in Hivernage, this spa hotel is within a 10-minute walk of Palais des Congres and Menara Mall. Jemaa el-Fnaa and Menara Gardens are also within 2 mi (3 km). Marrakech Central Station is 15 minutes by foot. 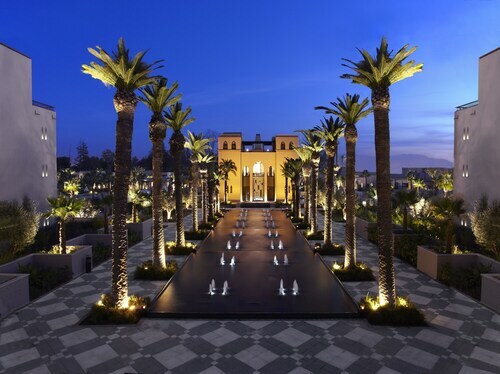 This family-friendly Marrakech hotel is located near the airport, within a 15-minute walk of Palais des Congres and Menara Gardens. Jemaa el-Fnaa and Menara Mall are also within 3 mi (5 km). Marrakech Central Station is 21 minutes by foot. Located in Gueliz, this spa hotel is within a 15-minute walk of Royal Tennis Harti and Palais des Congres. Koutoubia Minaret is 1.1 mi (1.8 km) away. Marrakech Central Station is 19 minutes by foot. 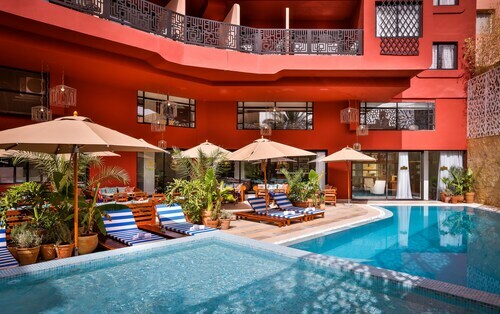 This family-friendly Marrakech hotel is located near the boardwalk, within 2 mi (3 km) of Palais des Congres, Menara Gardens, and Koutoubia Minaret. Jemaa el-Fnaa and Saadian Tombs are also within 3 mi (5 km). Marrakech Central Station is 13 minutes by foot. Question : What airports do you fly into for Marrakech? Answer : Pearson International Airport is a wonderful airport, but there is a lower cost option in getting you to Marrakech— Billy Bishop Toronto City Airport. It's only 11 miles away from YYZ and flights are being priced 21% cheaper over the next few months. Answer : The cheapest day to fly from Toronto to Marrakech is on Monday. If you would like to save some cash on your next holiday look for flights on that day. Question : What is the cheapest airline flying from Toronto to Marrakech? Answer : Flight prices are hitting as high as $2,623 over the next three months when flying to RAK from YYZ. Check out Air Canada, as customers have been booking flights at just $870. Question : What is the cheapest date to fly to Marrakech? Answer : As of Apr 15th, the cheapest day to fly from Toronto to Marrakech is May 8th. Tickets are presently being sold for $870, 41% less than the average price for this route. Question : How much time do people spend in Marrakech? 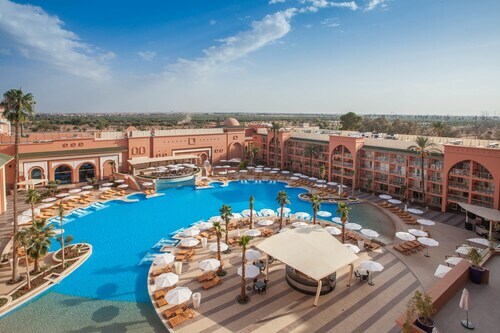 Answer : The average time spent sightseeing in Marrakech by passengers from Toronto is 10 days. However long you decide to stay, give yourself plenty of time to see what makes Marrakech fantastic. Answer : Yes, you can switch your departure or arrival date. If you want to save a little cash in doing so, the cheapest day to fly in April is Monday. If you like to go with the flow, you may just find that you can pocket some additional money.